Sanders: Thank you, Koch brothers, for accidentally making the case for Medicare for All! Sen. Bernie Sanders, I-Vt., thanked billionaire mega donors Charles and David Koch for unintentionally helping make the case for Medicare for all. Sanders’s remarks came in a video posted on his Twitter account. The words: “Thank you Koch Brothers” appeared on top of the video. “Let me thank the Koch brothers of all people for sponsoring a study that shows that Medicare for all would save the American people $2 trillion dollars over a 10-year period. “I suspect that is not what the Koch brothers intended to do, but that is what is in the study of the Mercatus Center – an organization that is significantly funded by the Koch brothers. 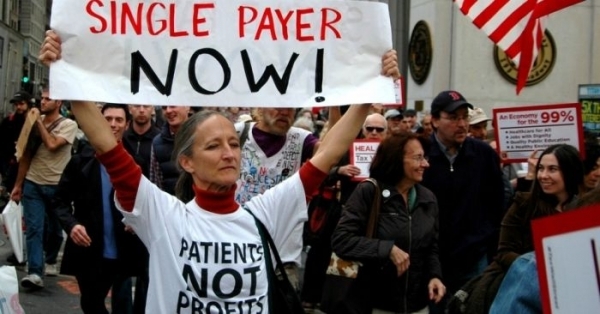 “At a time when the United States spends far more per capita on healthcare than any other country on Earth, almost 18 percent of our GDP, a Medicare for all healthcare system would save the average family significant sums of money. A single-payer Medicare for All system would reduce the amount the U.S. spends on health care by more than $2 trillion, a Koch brothers-funded study released Monday found.